I have been on some type or form of diet since I was a freshmen in college. 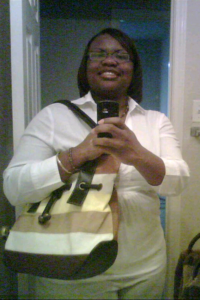 My weight just seemed to fluctuate throughout my entire adult life and I was never truly comfortable with my size. I tried quick weight loss programs and they worked, but the results were temporary. I tried the Lemonade cleanse and it worked, but the weight came back and brought more with it. 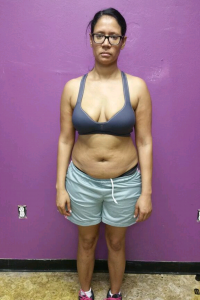 One day I decided that I needed a permanent solution to my weight problem and I had seen a few of the women Reggie helped with body transformations so I reached out via social media and my life has changed for the better! Honestly I wasn’t fully committed to the program at first and I must admit that the challenge of the workouts got to me and I quit. Some time passed after I left and I noticed that I was experiencing shortness of breath whenever I did any physical activity (climbing the stairs or running short distances) and once again I had gotten uncomfortable with my own body. It was then that I made up in my mind that I was going to come back and not only train with Reggie but I was going to commit to this healthy lifestyle. One of the best decisions I have ever made was committing to this fitness programs. Reggie has helped me to establish goals and move beyond what I thought I was capable of doing. Everything about his program is specialized and is geared towards the individual. 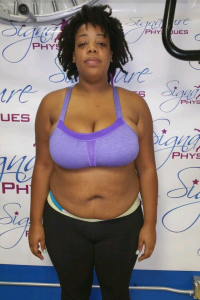 Initially when I came back I was just looking to lose 20 lbs. but Reggie has a way of pushing his clients beyond their goals and 50 lbs. later I’m still setting and crushing new goals! 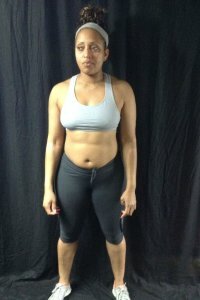 I tried a few times on my own to lose weight, but never really had major success due to a lack of great guidance or the tools needed to actually be successful. 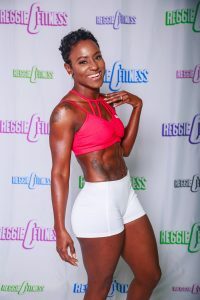 Running across Reggie has been one of the greatest things that has happened to me in Houston, and as what I believe to be Houston’s best female trainer, he has given me great guidance, accountability, encouragement, and every tool needed to reach my fitness goals. 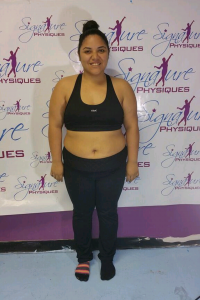 What began as a quest to FINALLY “lose weight” 30lbs to be exact) has turned into something much greater than a desire to decrease a number on a scale. I am in better shape physically and aesthetically than I was as a high school cheerleader, and I now desire to be healthy, fit and implement overall wellness into my lifestyle, while constantly improving my physique along the way. Reggie has also helped me understand the importance of nutrition and eating according to my goals, which has been a major key to my transformation. The most important transformation that has taken place over the last nine months since training with Reggie has been the transformation of my mind. I no longer believe in limits, and I know that whatever my mind perceives, my body WILL achieve…with discipline and a relentless work ethic. In addition, Reggie has built a safe, exciting, encouraging community of women who motivate and hold each other accountable daily. Fit sisters turn to fit family, and it is impossible not to want to do or be great when surrounded with so much positivity and accountability. Reggie is able to meet you where you are, and has a way of pushing you to exceed well past wherever it is you THOUGHT you wanted to be. His attention to each client’s individual fitness and nutrition needs is conducive to our overall growth, success and improvement in strength and aesthetics. 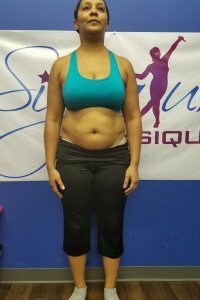 Six months in I was down 30lbs and 10% body fat. Nine months in, I achieved a 50+ lb weight loss, shed a ton of body fat, built muscle, a shape, strength, endurance and confidence AND saw my body fat percentage reach the teens. I can’t wait to see what my 12 month transformation will bring, and beyond! I look forward to growing and glowing with Team RCF in the future! Before training with Reggie, I’d tried various forms of exercising, diets and had many personal trainers over the years. I would do okay for a short time, then fall off the wagon over and over again. I would also get discouraged due to various injuries. 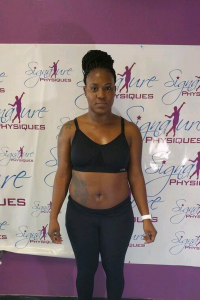 I was at my heaviest ever in life and just recuperating from my fourth knee surgery when I heard about Reggie C Fitness and the ladies at Signature Physique. I was impressed at how strong yet feminine the women were. I was also intrigued by the different workout programs. 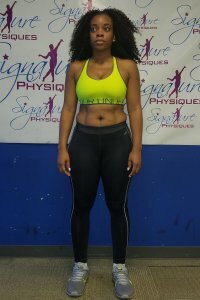 I jumped right into the small group training and bootcamps. 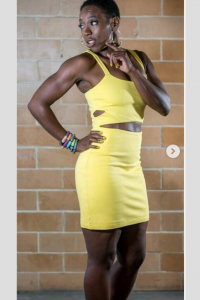 From day one, ladies of all races, ages, and fitness levels have encouraged and motivated me on this fitness journey. I used to not understand Reggie’s methods of pushing us to be great. I can’t count the number of times I asked “You want me to lift all of this weight?” “Trust the process” became my mantra because getting fit is a mental as well as a physical challenge. The process works and is continuing to pay off with big results! Reggie’s confidence in my potential has helped me to have faith in my abilities. He leads by example and his dedication to his clients is amazing. The support from him and the ladies at Signature Physique made me realize that anything worth having is worth working for! I really didn’t know what I was signing up for when my friend and I walked into the doors of Reggie C Fitness. I had already run a marathon, did a competitive bike ride, and actually THOUGHT that my body was in the best condition that it could possibly get to when I met him. I had NO idea of what I was capable of achieving. I thought heavy lifting was for girls that wanted to look “manly”. But to my surprise, it took my body to levels that I had NEVER seen. His work ethic is unmatched. He is passionate about his craft and his quest for excellence pushed me to give my best. I recommend him to anyone who is serious about starting or strengthening their fitness journey. 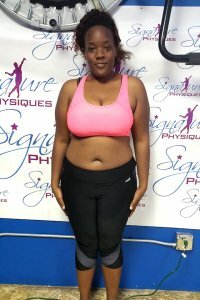 I have been trying to lose weight for almost 10 years now. I was comfortable in my skin, but one day, I went to the doctor and was informed that if I didn’t lose weight, then I could suffer from health complications in the future. I knew that if I didn’t want to develop diabetes, hypertension, or any other weight related ailment, then I had to do something different. I would start different journeys to a healthy lifestyle…from fad diets to Weight Watchers to workout challenges that I found online, to countless gym memberships; journeys I never completed. Then, one day, a friend told me about Signature Physiques. She told me that it was an all-women’s gym that offered boot camp classes. 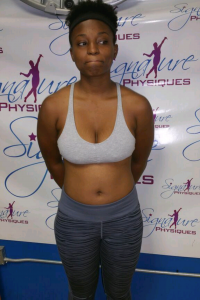 After my first boot camp class, I knew Signature Physiques was the right place for me. I was among women from different backgrounds with the same goal in mind; to become better versions of themselves. After months of boot camps, I decided that I wanted to start small group trainings with Reggie. My first small group training session was beyond challenging and afterwards, I felt like I was near death. Muscles hurt that I didn’t even know existed! As I was leaving, one of the ladies asked me if I was coming back. I must admit, my body screamed “NO” but I made up mind that I wasn’t giving up. Reggie challenged me when I thought that I couldn’t do it. His encouraging words and those of my fit sisters helped me through every dreadful rep. Here I am now, 30+ lbs lighter and down 11% body fat, and I feel like a totally different person; not just physically, but mentally as well. Training with Reggie has brought me so much confidence and has reinforced that I literately can do ANYTHING that I put my mind to. All I have to do is DO IT! I have learned a lot as well. Reggie not only demonstrates but he educates. I have learned what food is for, what it does to my body and how it translates to my overall health and ultimately contributes to what I look like physically! I also have a better understanding of the importance of weight lifting. I once believed that if a woman lifted weights, she would look like a man. I was COMPLETELY wrong! I’m addicted to weight lifting now and I see how important it is to obtain the lean figure that I have always desired. Thank you so much, Reggie! I’ll never forget that moment Reggie had me face every roll I tried to tuck in my tights, every back fat I tried to hide behind my weight lifting brace, and every creves and curve I kept hidden to only highlight the features I wanted shown for my before transition picture. So many people asked why are you even trying to lose you look good. Well it’s only because I only showed what I wanted them to see. Been working out for as long as I can remember but this man here brought out an entirely different beast in me. Everything that could have went wrong during this fitness journey in my personal life happened from my career change, ex-spousal issues, and business ventures but he was there as a counselor, mentor, trainer & never let me give up on myself! Truly love him and the supportive fit family for it! Reggie challenged every area of discomfort and pushed me in ways I never thought was possible. He believed in me and pushed me beyond limits than any other trainer experienced in my past; surpassed my expectations of safe and created workouts that longingly challenged my body to avoid the plateau of adaption. When I first set foot inside Signature Physique Studios I truly didn’t know what I signed up for but have heard and seen so many ‘Life Transformation’ stories through pictures. I’m just grateful to now be a testimony as one. Crossing paths with Reggie Collier has been a blessing and thankful that he was faithful enough to follow his God Given dream & talent. I have never been this fit in my life ever! Now I get stopped practically everywhere I go and asked if I’m a trainer myself, if it’s genetics or just a lifetime of playing sports. I come from a family build of thick-proned and big boned so neither of the prior mentioned I fit in. All hard work & dedication. I have been with Reggie just shy of almost a year now & cant wait to continue this journey of where he will take me next. One of the best there is and I thank him for helping me reach a lifelong dream within a milestone! I came to Houston for work as a travel Nurse on a contract. 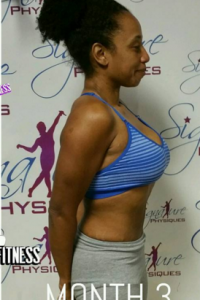 I ended up stumbling upon Reggie Collier and Signature Physiques Studio on Instagram while looking for a trainer. 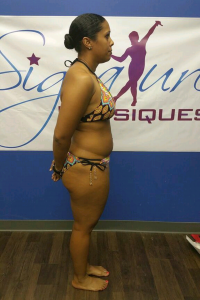 I was fed up with myself, disgusted, stuffed, and the scale was practically hitting 240 pounds. My eating was out of control. I remember going to Frenchy’s and getting me a 5-piece chicken meal with fries, rice, 6 rolls, AND a slice of sweet potato pie, and on the way home stopping at Burger King for a whopper with cheese and bacon meal, size large, with a diet coke. I would literally go home and eat all of that until my heart and stomach were content. My aha moment came when a friend asked me to be in her wedding. I went and tried on the dress and I remember thinking to myself I can’t wear this dress in her wedding. It was a one shoulder short above the knee dress. I felt so self-conscious in it. I asked the sales person to take a picture of me in it and I remember looking at that picture feeling so down on myself. I ended up dropping out of the wedding because I was not comfortable enough to wear the dress. That made me feel so disappointed in myself. At that moment, I knew I needed to change. You see, I was the girl that wore spanx every day. I would wear long sleeves or a jacket to cover up my arms, because I thought they were too big and I wasn’t comfortable wearing them out. I was the girl that took hours to get dressed because I was so self-conscious. I wore black all the time to hide myself. I lacked full body pics. I didn’t wear shorts and struggled wearing dresses. I was so critical of myself. I was the girl that when a stranger would say in a store to me, “You’re so pretty” it would literally shock me because I didn’t feel that way. And I wanted to feel it so bad with everything in me but I just didn’t. 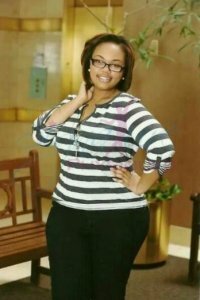 I let my weight dictate how I felt about myself. It was truly holding me back. I faked my confidence. But any time I had to prove it, I always failed at it. So, I decided I didn’t want that life anymore. Finding Reggie was honestly, the best thing that could’ve ever happened to me. I don’t say that lightly. Sometimes, you want to change so bad but you just don’t know how to or you don’t know how to stay the course so you can. There’s something so special about Reggie that it is truly my belief that he is gifted and assigned to do what he does. Reggie saw something in me that I didn’t see in myself. He believes in me. He pushes me. He encourages me. He’s literally with me every step of the way on this journey. And I really don’t know how to explain it but knowing that and receiving that from him, there’s something in me that doesn’t want to let him down so I keep pushing! As well as I don’t want to let myself down! I was originally only supposed to be here until my contract ended. Once it ended, I went back and forth about leaving or staying. As a travel nurse my life is literally moving every 3 months from state to state. I made a decision that I just couldn’t leave. I had goals! Not only that, I couldn’t bring myself to leave Signature Physiques Studio. The bond I had built with Reggie and his family and the ladies here at the gym was everything to me and I didn’t feel I was ready to leave yet. So, I stayed. I had no place to live, and no job but I put my goals at the forefront and prayed about it. I turned down contracts in other states, and I even turned down a nursing strike paying $50,000 to work for a month in another state. Being here and working on my health and fitness was that important to me. I have literally moved my entire life here to Houston from North Carolina to stay at Signature Physiques Studio and work with Reggie. People think I’m crazy but it was so worth it!! The sacrifice was big but the outcome was and is greater! When you want something bad enough, you go after it and give it all you’ve got! No amount of money could’ve given me what I’ve gained so far being here! I am no longer that girl with the spanx on and a jacket. Reggie has helped me to learn to love myself again and has taught me that I am stronger than I thought I was. He showed me that I can do anything I set my mind to. He’s literally helped to transform my life! And there’s no price tag that I could ever put on that! The ladies of Signature Physiques Studio have become my family! There’s something so special about women who can come together and uplift and encourage one another and that’s exactly what we do at this studio. If you’re thinking of working with Reggie, just stop thinking about it and do it! I can’t stress enough how life changing this has been for me. There was once a time I would look at his YouTube videos and cry because I wanted to change so bad. Now, I look and I’m in those YouTube videos and I’m changing and reaching my goals. 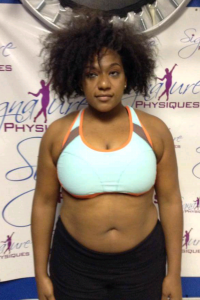 I look at that girl in my before pic and I see how unhappy she was. She deserved better and I’m so happy that I’m finally giving her that! If that’s you, give yourself better! You are worth the sacrifice! It will change your life! To say this has been one of the most worthwhile goals I have ever set for myself is an understatement. Initially when I started training with Reggie, I just wanted to lose 30 pounds. Well, 70 pounds later, I’m still there. The atmosphere at Signature Physiques is something special. It is all women, mostly minority, working on bettering themselves. I have never been around so many encouraging, genuinely nice and giving women in my life. My heart swells every time I think about it or walk through those doors. If you want to transform, if you want to push yourself, if you really want to improve, if you want those gains, if you want that physique you know is hiding beneath your doubt of self, if you’re really ready to put in work, then contact Reggie Collier at Signature Physiques!!! “He gone get you fine”!!! Lets go back in time…..Weight Watchers…..Quick Weight Loss….fad diets….starving…… These are just some of the “quick fixes” I have tried in order to lose weight. 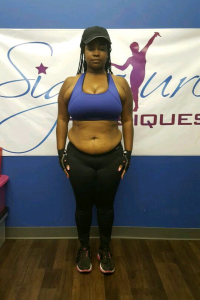 Then, there was Reggie Collier at Signature Physiques….. 10 months ago, I made the best LIFESTYLE commitment to myself that I could possibly make. When I walked into the studio, I was immediately welcomed and motivated by so many women with the SAME ultimate goal- to be healthy and become a better version of themselves. I instantly became apart of the Signature Physiques family. Reggie has challenged, motivated, inspired, committed, and dedicated himself toward helping me SURPASS my goals. Ill be honest, when I first started I told him many times “I cant”, “Im tired”, “It hurts”, “Im too fat”, “What are you doing to me?”, “Are you CrAzY!” But every time I came back, I found myself becoming stronger, faster and lighter. I soon realized that if you TRUST Reggie and the process, the results WILL come. If someone would have told me that this 267lb woman who loves pizza and watching F.R.I.E.N.D.S. will one day become a “gym rat” in less than a year, I would have said, “Who you talking to Willis?” LOL! But can you believe that someone was Reggie… He saw potential in me when I saw nothing but flaws and imperfections within myself. As I type this with tears forming in my eyes I can say REGGIE made me believe and trust myself and I know that ALL things work together for our own good. Those who know me, know that I am still in doubt over my transformation and they have to remind me daily that Im not “that girl” anymore. This is not only a physical change; but a mental change. This process is nowhere near over. I still have goals that I WILL accomplish, but knowing I have Reggie by my side cheering, challenging, motivating and trusting me makes me push harder. So stop reading my bio and come join me at Signature Physiques and let Reggie not only change your physical, but your mental. COME SWEAT WITH ME! Honestly I never really had to work hard for my body. I naturally always had a athletic build. So a few years a go I was diagnosed with urticaria ( hives) due to a reaction. But unfortunately for me, my allergist couldn’t find what was making me react. So they put me on steroids to suppress it. 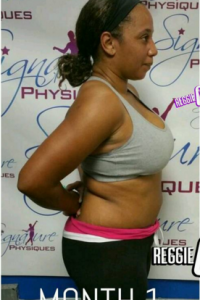 It worked with an additional 50-60 lb weight gain!!! Imagine how I felt, battling my allergies and the weight! Not to mention I never really had to work hard for my body I had to begin with ,so imagine my position. The final straw was when I went to the doctor and I weighed in at 230!!! Something had to change. I began researching online (mind you I had no social media) but I stumbled across Reggie. When I say it was the best decision I have made, I mean it! I came in with fictional weight loss goals ( I just want to loss my sides , just want to loss 20 lbs) lol 60 lbs later I’m hear. 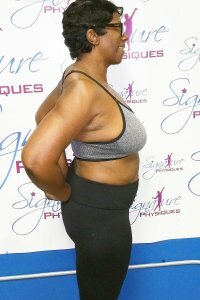 Reggie has instilled health and fitness as a life style change for me. 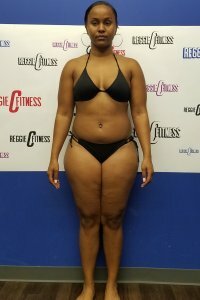 I went from never working out to doing so 6-7 days a week!! It doesn’t get easier you just get stronger!! Now I look on the outside as fabulous as I’ve always felt on the inside !!! 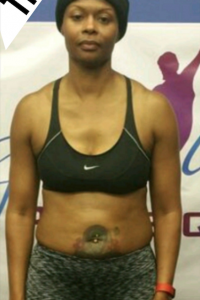 Not only did it physically and mentally change me,my health as improved tremendously!!! I have not had a reaction in 2 years!!! I was also at risk for high blood pressure and that is gone! I started my journey wanting to give myself the best 40th birthday gift ever and received so much more. I am so blessed to have crossed Reggie Collier’s path. All the things you want from a trainer i received 10 folds. He is my mentor, my leader, my counselor, my motivator, my friend, my fire starter and so much more. The energy he fills his studio with keeps you wanting more and more!!! It has become my addiction and I am no where near done. With Reggie by my side i have no doubt that their is so much more in my future than you see in this pic!!! Reggie has been an amazing addition to the betterment of my life and progress. Since the beginning of my weight loss journey he has been the constant key factor in my success. No matter how much I fought him, he never gave up. He saw something in me that I didn’t see yet, and I saw the same in him. I knew that he, was the person to get me where I wanted to be physically, with his obvious passion and dedication. He knows that every one body is different. There is no “cookie cutter” way of doing things, and that’s why he is so successful. He pays attention to each client and their individual progress, goals and needs to make sure they achieve their version of success. I’ve been apart of his team since day one and I haven’t looked back. I heard about Reggie from a co worker and I was like oh ok.. well like most women I was going on a trip to Miami thinking I was gonna get fit real quick! Well after the trip I came back! It was the best decision I’ve ever made.. it changed my life in more ways than one. Not only did it change me physically but, mentally and spiritually! He’s passionate about what he does and it shows through all his clients.. 3 months has now turned into 2yrs… I’m a client for life. I have never meet a man that knows a women’s body better than a women does. 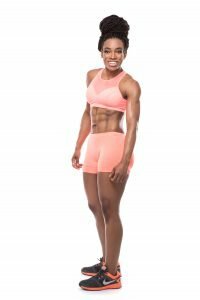 Reggie’s program is designed for women of all shapes and sizes and is 100% effective when followed. 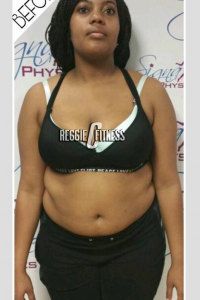 When I started the Reggie C Fitness program I was more then over weight, I lacked the energy and the motivation to believe that I could change my body. Working out with Reggie has made me confident in pushing myself to new limits and setting goals I did not think were possible 6 months ago. He always tells me to trust the process and the results will come. Well he is definitely right and I’m honored to have such and amazing trainer. 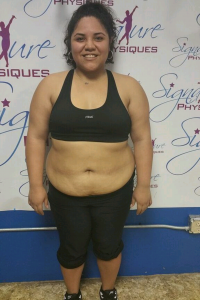 My journey has only just begun and I am beyond excited to see where Reggie will take my body. One of the reasons I have loved coming to signature physiques is because there is no other place in Houston like it. 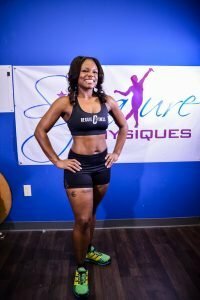 Reggie has cultivated a place where groups of women can come together and workout to achieve their goals. I drove from the North side of Houston to work out with Reggie simply because he is the best. There is no other way to put it. Reggie truly has a passion for helping women achieve their goals. No gimmicks, no get slim quick tricks, just hard work and dedication. Not only do you achieve your fitness goals- you also develop relationships with women who are all working towards fitness goals. Love Reggie! Wouldn’t train with anyone else! 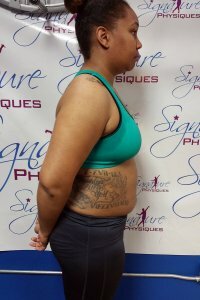 My journey with ReggieCFitness was honestly unintentional in the beginning. I was pretty satisfied where I was physically and just want to add “something new” for some specific areas. When I initially started with his “group classes,” I was immediately impressed with Reggie’s work ethic. HE CAME TO WORK AT 200% EVERYDAY!! He pushed each woman according to their levels to get out of that comfort zone. As I came to class week after week, I could visually see results of the women around me. No gimmicks, just hard work. I then progressed to his “small group training.” I had never been a “weight girl,” just running, yoga, classes, etc. This was so new for me. Reggie became a different “trainer” in this class. It was serious business! He pushed these women to levels that I never anticipated. There were no excuses, only effort! I was surrounded by strong, yet feminine, women who were striving for “greatness”, who challenged you while encouraging you just as much along the way. Reggie came with a new and unique challenge every class and I knew very early in the process that my mental strength would have to rise to the occasion in order for me to be successful. His leadership was defined by integrity in his work, his visible passion to see us succeed, and by his example of hard work and true dedication to “greatness!” The work was hard, the time was long, and the effort had to be both mental and physical but the results came. 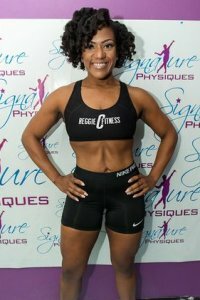 ReggeCFitness is a truly an example of what happens when people work in their passion and gifts. The dedication to you and your results is very personal to him. The time dedicated to you and your results, not to mention, the encouraging words expressed when you are ready to RUN AWAY (LOL) trains your mental -self to stick with it. He is in the trenches with you because he is always just as busy working on his personal goals. His example of “doing what it takes to get your results” is extremely motivating. I am so grateful to have met him! I am very thankful for him sharing his gift with me and for leading me on a journey that have literally changed my life. 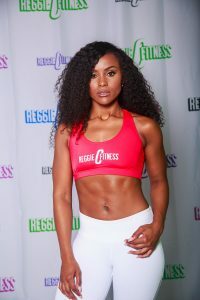 Thank you REGGIECFITNESS! NO EXCUSES, JUST RESULTS! If you want something you’ve never had, you have to do something you’ve never done.When I joined Signature Physique Studios I didn’t know what to expect. I knew in my head that I wanted to lose weight but I didn’t have a clear goal for myself. After leading a sedentary lifestyle for the last couple years I just knew I needed change. Starting off was VERY challenging but I stuck it through. I worked hard even when I wanted to quit, give up, wasn’t feeling well, etc. There were so many amazing women around me but I realized I couldn’t compare my journey to theirs! 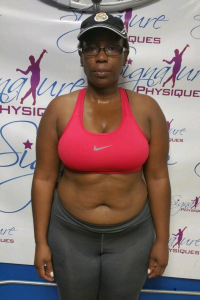 Reggie helped me see and believe that this journey is mental, the weight loss is a side effect. My mind was transformed first which allowed my body to follow. I started setting small goals to start and upon reaching them set bigger ones.Even if I wanted to give up I couldn’t because Reggie has cultivated a very positive and supportive culture in his classes. From celebrating each others progress, to encouragement, to swapping clothes as we lose weight, Reggie has created a goal driven hard working family which is why I keep coming back daily. There are no longer excuses in my mind. I know that if I want it I need to work for it, and I have!! This is just the beginning. 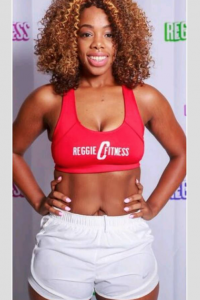 I joined Reggie C Fitness because I wanted to get back in shape. I expected to be challenged but I did not expect a community of friends and the transformation of not just my body but my mind as well. 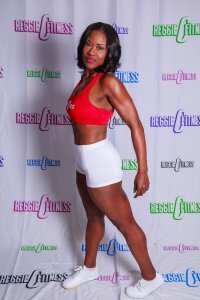 What I love about Reggie C fitness is from day 1 he has goals and a plan for you in mind. It’s wonderful and encouraging to have a trainer that believes in me more than I believe in myself. 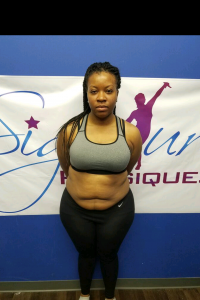 There is no limitation on how far we could progress because Reggie is always creating new workouts and goals for everyone.I started off slowly coming every now and then but as soon as I committed to the process I saw phenomenal results. Even more amazing, I did not crave the foods I used to. Days I would eat a “cheat meal” I would feel groggy and tired. I became stronger, faster and loved the way I looked and felt. 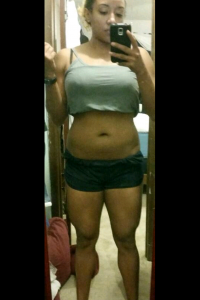 I did not undergo a huge weight loss but my body became very toned as my body fat continued to lower. Before Reggie I did not know how to be healthy or what to do at the gym. Now I not only have a strong support system with the women in the gym but fitness knowledge and tools to use to continually progress in and out of Signature Physique Studios. 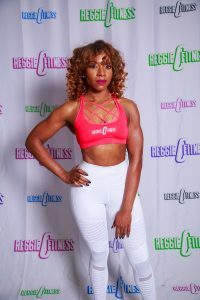 There is no other trainer like Reggie C fitness. Sig Physique is not just a fitness center we are a family and everyone keeps everyone accountable. For someone like me who needed that extra encouragement and motivation Reggie stepped in and I cannot go back to where I was before. Reggie was my personal trainer for a year. The results I achieved during this time period speak for themselves. Each workout never failed to challenge me. He always made me feel comfortable in the studio, whether he was correcting my form, giving me constructive criticism or spotting me during my workout. His motivation, energy and knowledge about fitness helped me to achieve my goals. Not only did I learn new training methods and exercises but I gained an everlasting friendship as well. He helped me realize the importance of training ABS! I use to dread doing them and now I have grown to love them. Reggie has been a blessing in my life. He always pushed me to take that one extra rep when I was tired. If you are looking to take your body to another level and challenge yourself both mentally and physically I would highly recommend Reggie Collier. He is an inspiration to many, including myself. Building and maintaining a nice well-toned body requires hard work and dedication. I’ve had other trainers before Reggie, they don’t compare. The difference? He pushes you further than you thought you could go. Even when I don’t want to do another set or lift an additional 10, 20, 30 pounds, he pushes me through it. Unless you’ve done serious HW on how to train, your muscles will become bored, you will plateau. Reggie has already studied and researched and done your homework for you, he knows exactly what you need and when you need it. He monitors everyone’s individual goals, progress, weaknesses and strengths. You just have to trust Reggie and the process and you are guaranteed success, Reggie delivers. He will have you sore every day. I started out thinking the workouts would get easier, they really don’t, they are always a challenge, and that’s what your body needs. Your muscles will NEVER be bored, on the contrary, they will be excited, literally, jumping. And not only will you have an amazing trainer that believes in you, you also have all the support, motivation, and encouragement from the ladies working on their own individual goals, just like you, at your side. Its team work, women empowering women! Everyone at the gym is your cheerleader! Reggie lives what he teaches, he is the guy to get you in the shape you want. Whatever your goal is, lean out, tone, gain muscle/bulk, he can do it, he’s your guy! For years I participated in high impact aerobic and kickboxing classes and continued to eat unhealthy without any strength training!!! I had it all wrong…..until I met…HIM..the no nonsense Trainer Reggie Collier!! He is the the most influential person I have ever met. He’s said so many things to me that has been beneficial for me. One statement will be branded with me always ” If it doesn’t challenge you, it won’t change you “. Truer words were never spoken…it is impossible to even spell Challenge without spelling Change !! 32 lbs may not seem like a lot of weight loss, but it was for me, because I gained 100 lbs of confidence. He encouraged me to participate in the 30 day Challenge, and as difficult as it was..in conclusion you realize, it’s not Reggie’s challenge, its my challenge against myself. 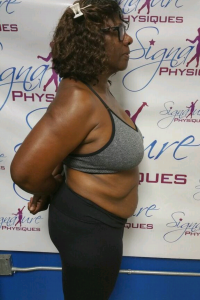 …When everything feels like an uphill struggle…think of the view from the top..I’m 69 yr old…but I can still learn from somebody 30..I don’t have ” Good” results from Reggie Collier and Signature Physiques..I have “Great” results !!! 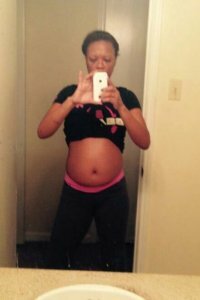 I have battled with my weight all of my adult life and tried pretty much every “quick fix” weight loss remedy that was on the market. I would lose the pounds but gain more than I lost. All of my life I’ve put my children, family and friends first and put myself on the “back back back” burner. But on August 9, 2015 I looked in the mirror and decided that I really needed to start focusing on me, my health and my well being. It was time to make an investment in myself and start working with a personal trainer. High blood pressure, cancer, diabetes and heart disease runs in my family and at the rate I was going I was definitely a candidate for so many preventable illnesses. On August 10, 2015 I took the first step and didn’t think I would survive! But because of my determination, motivation and personal goals I refuse to ever quit! My self esteem and my self confidence has increased tremendously. I now have more energy and more drive towards my life. I credit this all to the best trainer in Houston; Reggie Collier for seeing my potential and for not giving up on me! 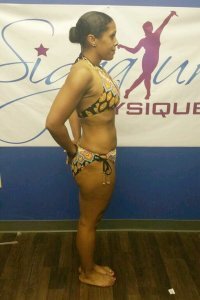 I walked into Signature Physiques with a vision and plan. 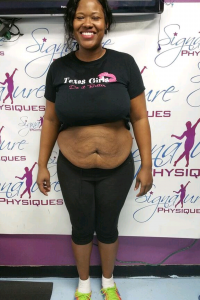 I heard about Reggie C Fitness thru a coworker and saw her transformation right before my eyes. Before meeting Reggie I already had all the confidence he would help me reach my goals. I started in November of 2015 and from the moment i entered his studio, I have not looked back. 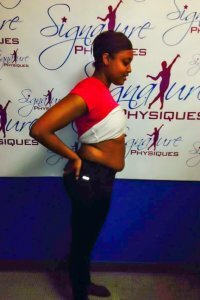 Signature Physiques is not just a place to lose weight, you gain a whole new family. The gym is filled with inspiring women who are working toward the same goals you are. I’ve never been to an all girls gym before like Signature Physiques. I was scared it would be more of a competition than a support system but I was completely wrong. Reggie doesn’t only teach you that you are able to reach your goals with hard work and dedication but he gives you a whole new mindset on life. I never thought I would be a girl that would have transformation pictures to talk about. Here I am a year later giving fitness and health advice to family and friends. There is no room for excuses at Signature Physiques. You will have dozens of women letting you know that you are able to do the same things they are, regardless of your fitness background. 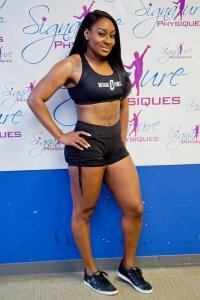 Reggie C Fitness has changed my life in more ways than one. 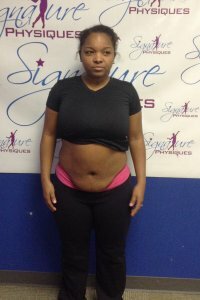 If you have determination and just need direction and support Signature Physiques is the place for you. I am a 34 year old and recent beneficiary of an anterior cervical discectomy fusion who had many concerns and mental anguish surrounding the level of physical activity I would be able to resume after the surgery. With two titanium rods in my cervical spine and reliance on muscle relaxers to sleep due to the neck pain, I finally decided I had to gain my strength back. February 2015, I sat down with Reggie to go over my goals, his goals, and how we would begin to accomplish getting me back happy and healthy. Reggie had never worked with someone in my situation, but he never once turned away the challenge to getting me stronger. After just two short weeks of working with Reggie, I begin to regain upper body strength and improved my endurance level tremendously! And the best part of it all…I no longer need to rely on a muscle relaxer to fall asleep! The pain vanished after I begin Reggie’s weight training program. At my post 90 day surgery follow up, my orthopedic doctor measured my strength, and said whatever you are doing please do not stop! Your progress is tremendous…A+! On top of the physical limitation I was overweight and my BF% way to high. After 12 weeks of following Reggie’s guidance, my results with have certainly impressed me! I’ve worked with a number of different trainers over a lot of years and didn’t feel like I made much progress; with Reggie I have more energy, I feel better, my clothes fit looser and best of all he has shown me how to work and overcome any and all limitations to achieve great results! I am down over 28 pounds and BF% dropped by 10%, and still going! Reggie has helped me to realize the importance of working towards optimum health and well-being by making these areas a priority in life. He is a true testament to healthy living and chose to apply the knowledge he has gained. As a result he has enhanced his life and has chosen to enhance the life of others. Reggie as your client and friend… you are a God-send.” God is blessing you so continue to keep him first in your life! One of the best decisions of my life!! Before coming to train with Reggie C Fitness I never really worked out. Occasionally doing a Zumba class and walking on a treadmill or elliptical machine for 30 minutes. Paying for a gym membership that I hadn’t attended for months. Food was my best friend and I can EAT. Weight had always been a part of me. Size 16 is the smallest I could remember being, and that was in the 7th or 8th grade. However unlike most I was HAPPY as I was. 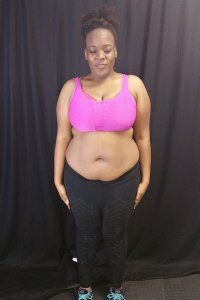 So what made me decide to start my weight loss journey? I knew one day I would want to be a mother and a wife. I want to be able to be active with them and pass on healthy habits to my future family. So I thought I better start now!! 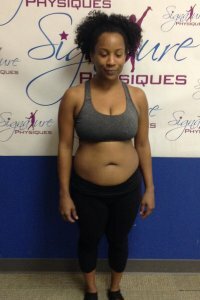 I started attending the Signature Physiques bootcamp classes, and really enjoyed them. The environment was welcoming and enjoyable to be around. Now they were definitely challenging and unlike anything I had done before. I welcomed the challenge and wanted to push a little more. Then I started to train with Reggie. That’s when my body really started to change. My endurance picked up, enjoyed the challenge of lifting weight, and even Cardio. An added bonus is that I no longer have to stay confined to the Plus size section (which saves so much money). One of the greatest parts of this decision is the connections I have made. The women are encouraging and will hold you accountable for your goals. We all need that push or motivation at times. You will definitely receive that here. I am down 50 plus pounds, muscles are forming, and stress reduced. I’m able to do amazing things I never thought I would. To top it off I’m even happier than I was before. 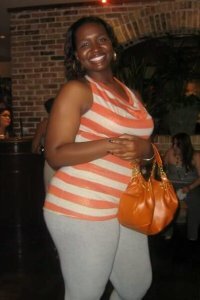 My journey has just begun and you will definitely see more big changes from me!! 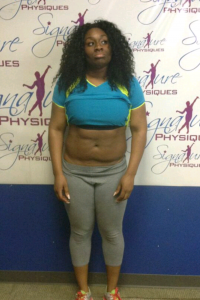 Working with Reggie at Signature Physiques Studio for 1 year has challenged my mental & physical state of being. Meeting Reggie and discussing my goals, he assured me that his program would help me achieve my goals. I started off weighing 156lbs, along with my body fat percentage in the mid-twenties. 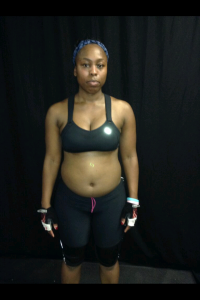 My focus was losing weight, decrease my body fat percentage as well as increasing my strength & cardio training. With his wide variety of techniques which makes his program unique & fun allowed me to do so. Somedays, I walk into the studio thinking this man is crazy but I have learned that there is a method to his madness which produces continuous results. We live in a society where we are treated with food. Whenever I did well in school we went to my favorite restaurant, or I was able to get my favorite snacks. I wasn’t taught portion control especially since my mom made me eat all my food because I couldn’t get up from the table til I did. Losing weight has always been a struggle for me. Reggie has taught me portion control and the importance of toning while losing the weight. Reggie works alongside hundreds of women daily but he remembers each of our goals and makes sure we achieve them. He also teaches us proper form. I have gained self-control, self-confidence, self-worth and higher self-esteem. This is the absolute best decision I have made in my life.